Thank you to those who have signed the visitor’s book and left thoughtful and complementary comments. We try our best to keep the church in good order, with fresh flowers and tidy grounds. It is a country church, so we expect some long grass and weeds outside and the occasional muddy footprints on the carpet and a church mouse inside! On the 12th May, 26 members of the Shropshire Archaeological Society led by David Pannett visited Melverley church. They enjoyed an informative history talk outlining the many changes to the church from 1400 to the present day. Lynne Lloyd also told them about the church restoration in 1990. The group then looked around the church. This was followed by tea and cakes outside, as it was such a lovely day. Later David Pannet took the group on an archaeological walk around part of Melverley explaining the nature of the land from glacial times to present day flooding. 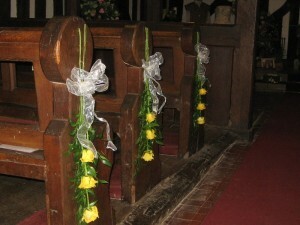 The Easter Sunday ‘Dawn Service’ was held this year at Melverley Church. Fortunately, although very early and cold it was a bright, dry morning. 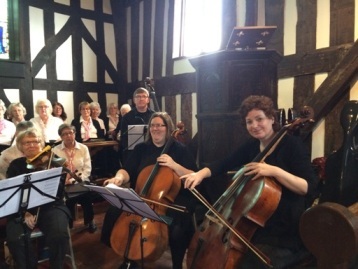 We were delighted to welcome the Yeomen Singers, a local community choir, along with the Meole Brace mini orchestra who performed an exciting and delightful Easter programme for us, reflecting the Easter season. The concert was well attended and continues our wide and varied music themed annual events. Again the church was part of the national and local area event. There was a steady flow of visitors throughout the four days with many staying for the history talks. 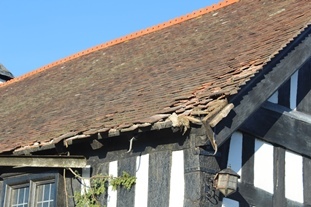 Church repairs – the repairs to the church roof, tower and wall are now all complete. Concert at the church, Saturday 10th June: Although the weather was not at its best on Saturday evening a full church enjoyed an evening with ‘The Coppice Singers’ who sang a wide range of songs from musicals and films. The evening was full of pieces which brought back memories, poetry and ‘ditties’ and laughter. Thank you to all in the choir, those who came to support the evening and everyone who helped with refreshments to make this yet another successful event. A donation from the event will go towards the choirs chosen charity this year- The Fertility Unit at Royal Shrewsbury Hospital. 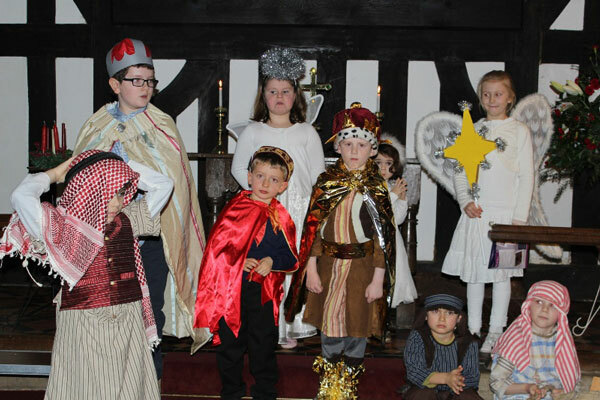 Christmas – Carols and nativity service- Again a full church with the children and young people of Melverley taking part in the nativity story. 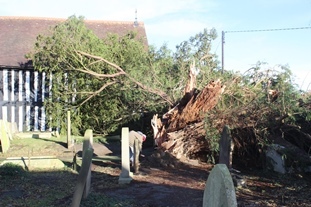 Storm – On Thursday 17th November a sudden storm which hit the region brought down the large, old yew tree in the churchyard. It is believed the tree was around 300 years old. It was a familiar feature of the church and the space left by it has changed the whole character of the site. There is however a much better view of Rodney’s pillar! There was some damage to the bell tower where slates were blown off, some to a corner of the roof from the falling tree but the internal structure of the church building appears to be untouched. 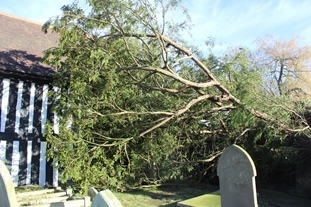 The weight of the tree brought down an old wall and a few headstones but on the whole there was less damage than first envisaged. Harvest Festival: followed on Sunday 2nd October with a very good congregation and traditional harvest hymns. 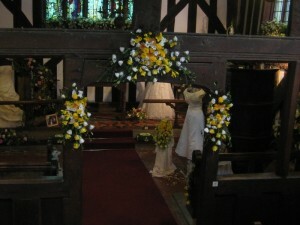 Once again the church was decorated beautifully with fruits, vegetables, berries and leaves. 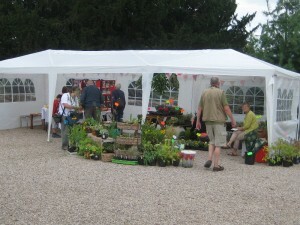 The produce given was donated to Hope House hospice. Harvest lunch – On Sunday 25th September we celebrated harvest with a harvest lunch at the village hall. Food was plentiful and everyone present enjoyed a two course meal, good conversation and a catch up with neighbours. 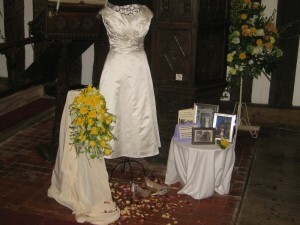 Heritage Open Days – The weekend of 9-11th September was a very busy one for Melverley Church. Many visitors came to visit the church as part of The Heritage Open Days held across the country with Oswestry and district holding a very wide variety of events. 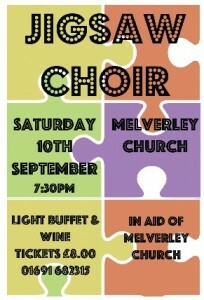 Saturday 10th of September saw a visit from the Jigsaw Choir In aid of Melverley Church and Blood Bikes. Photos of the event to follow. For more information on the wonderful Jigsaw Choir click the image to the left. Easter day – Melverley Church Easter Day service took place as a ‘dawn Service,’ 6.30am. A very early start to the day especially when the clocks had just gone forward by one hour, 5.30am! It was a truly memorable service which began outside just as the sun was rising. Lent Lunch – A successful lent lunch took place in Melverley Village Hall on Monday 24th March. The lunch raised £157.55 for the Bishop’s Lent appeal. Proceeds from this lent appeal will highlight and support The Children’s Society projects which specifically support and care for vulnerable children living in our parishes and overseas. Thank you to all who helped to raise this donation. 4th October – Harvest Festival at 6pm in St Peter’s Church. 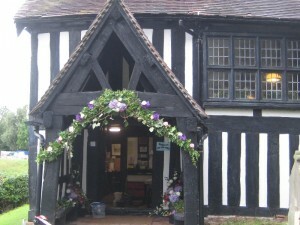 3rd October – Melverley Harvest Supper, Melverley Village Hall. Again we celebrated harvest in our community with ‘A Harvest Supper’ evening, a traditional family event with a hearty 2 course meal and entertainment. 10-13th September- National Heritage Days. 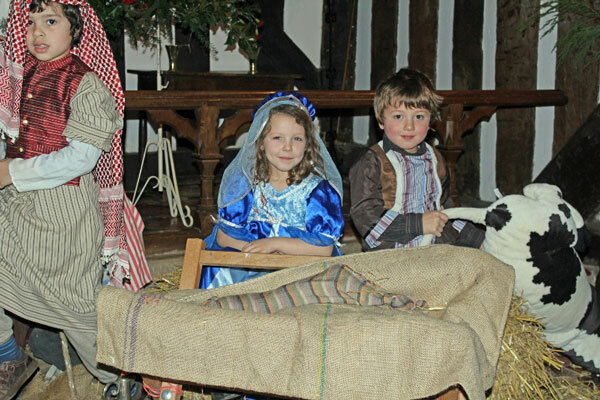 The church took part with the Oswestry Heritage group and was open each day. It was part of the ‘churches trail’ and there was history talks and refreshments each day. 28th March – Everyone enjoyed the first ‘Indoor Kurling’ evening, which took place in the Village Hall. Competition was quite intense at times but great fun. 19th March – A successful charity Lent Lunch took place on 19th March. A total of £100 was raised for our charity African Village Support. The Christmas festive evening held at the village hall in Melverley on Thursday 20th November was our last fundraising event this year. Stalls included: jewellery, Christmas wreath making, cakes, hand made cushions, Christmas gifts, bring and buy, local produce, local honey and a butcher. Stephanie Price – Pampered Chef demonstrated an alternative festive bread and butter pudding with sisters Kerry and Julie volunteering to aid the chef. 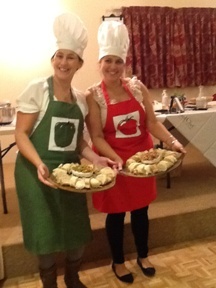 Later the sisters went head to head in a fun Ready Steady Cook competition. 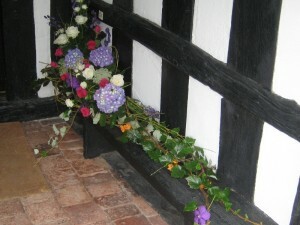 Melverley Flower Festival – August 2013.